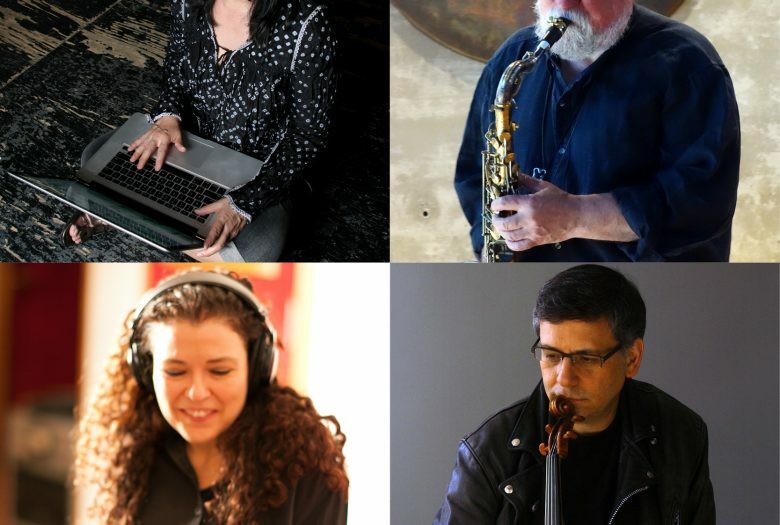 Virtuosos of their instruments and masters of improvisation, Evan Parker (sax), Sylvie Courvoisier (piano), Mark Feldman (violin) and Ikue Mori (electronics) make a rare appearance in this special quartet project and will be celebrating the first recording of the quartet this fall. Ikue Mori started playing drums with the band DNA when she moved to NY in 1977. Soon after she became involved with the improvising scene through John Zorn, playing drum-machines for 1985-99, and laptop computer since 2000. Mori has subsequently collaborated with numerous improvisers throughout the US, Europe, and Asia, while continuing to produce and record her own music. In 2007 Mark Feldman was presented with the Alpert Award in the Arts. He also received a Grammy Certificate for his performance on Michael Brecker’s album, Wide Angles. He has worked frequently with John Zorn, John Abercrombie, Dave Douglas, Sylvie Courvoisier and on occasion with Paul Bley, Muhal Richard Abrams and Anthony Davis. “If you’ve ever been tempted by free improvisation, Parker is your gateway drug“, wrote standup comedian and free-jazz fan Stewart Lee in The Guardian in 2010. He didnt mean Charlie Parker but Evan Parker, the British jazz saxophone revolutionary who transformed the language and techniques of the instrument in the late 1960s and has since become one of the most admired and influential saxophone improvisers on the planet. Parker has been rewriting the book on the sounds that can be made with a saxophone for almost half a century, developing a remarkable post-Coltrane technique that has allowed him to play counterpoint on what was designed as a single-line instrument, generate electronics-like textures acoustically, and build a personal soundscape that avoids conventional tunes but has its own arresting lyricism. Parker has worked with comparable revolutionaries like John Zorn and Anthony Braxton, and played in experimental electro-acoustic groups and contemporary-classical ensembles – but he has also brought a sharp edge to more orthodox jazz lineups led by Stan Tracey, Kenny Wheeler and by the Rolling Stones Charlie Watts, and the celebrated South African orchestra Brotherhood of Breath. He has also recorded with singer-songwriter Robert Wyatt, with TV comic Vic Reeves, and has lent his inimitable sound to the more pop-oriented contexts of Scott Walker, David Sylvian and Jah Wobble. Evan has also curated festivals and run his own record company. Sylvie Courvoisier is a pianist, composer and improviser. Born in Lausanne, Switzerland, Courvoisier moved to Brooklyn, New York in 1998 and has led several groups over the years and has recorded over 60 records for different labels, most notably ECM, Tzadik and Intakt Records. Courvoisier has performed and recorded with John Zorn, Yusef Lateef, Erik Friedlander, Herb Robertson, Tim Berne, Ellery Eskelin, Lotte Anker, Fred Frith, and Tomazs Stanko.